The Icon of the Mother of God, named "Three-Handed": The wonderworking image, before which the Monk John Damascene (Comm. 4 December) received healing of a cut-off hand, was given over by him to the Laura of the Monk Sava the Sanctified. In the XIII Century the icon was situated in Serbia, and afterwards it was miraculously transported to Athos to the Khilendaria monastery. The Icon of the Mother of God, named "Of Three Hands" ("Troeruchitsa"): In the IX Century at the time of the Iconoclasts, the Monk John Damascene (+ c. 780, Comm. 4 December) was zealous in his veneration of holy icons. Because of this, he was slandered by the emperor and iconoclast Leo III the Isaurian (717-740), who informed the Damascus caliph that the Monk John was committing treasonous acts against him. The caliph gave orders to cut off the hand of the monk and take it to the marketplace. Towards evening Saint John, having asked the caliph for the cut-off hand, put it to its joint and fell to the ground before the icon of the Mother of God. The monk begged Our Lady to heal the hand, which had written in defense of Orthodoxy. After long prayer he fell asleep and saw in a dream, that the All-Pure Mother of God had turned to him promising him quick healing. Before this the Mother of God bid him toil without fail with this hand. Having awakened from sleep, the Monk John saw that his hand was unharmed. In thankfulness for this healing the Monk John placed on the icon an hand fashioned of silver, from which the icon received its name "Of Three Hands". According to tradition, the Monk John wrote a song of thanksgiving to the Mother of God – "All of creation rejoiceth in Thee, O Full of Grace", which appears in place of the Mother of God hymn "Mete it is in truth" in the Liturgy of Saint Basil the Great. Saint John Damascene accepted monasticism at the Laura monastery of the Monk Sava the Sanctified and there bestowed his wonderworking icon. The Laura presented the icon "Of Three Hands" in blessing to Sainted Savva, ArchBishop of Serbia (+ 1237, Comm. 12 January). 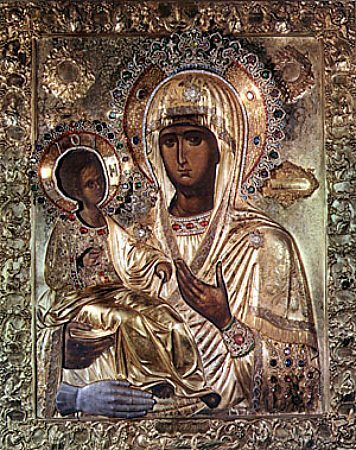 During the time of an invasion of Serbia by the Turks, Christians wanting to safeguard the icon entrusted it to the safekeeping of the Mother of God Herself. They placed it upon a donkey, which without a driver proceeded to Athos and stopped in front of the Khilendaria monastery. The monks put the icon in the cathedral church. During the time of discord over the choice of hegumen, the Mother of God deigned Herself to accept to head the monastery, and from that time Her holy icon has occupied the hegumen's place in the temple. And from that time at the Kilendaria monastery there is chosen only a vicar, and the monks by monastic useage receive from the holy icon blessing in every obedience.